No monitored cities are below the MaxNormalSafeLevel. This is a Bad situation for all exposed to the Rad. 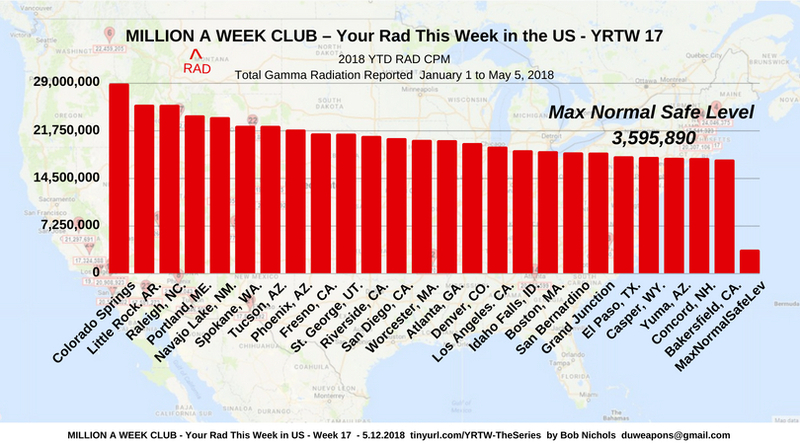 Now included, for the 17th Week of 2018 just passed, all cities above 17 Million CPM  Year to Date [YTD] of deadly Gamma Radiation. Today’s 125-day or 3,000-hour report for January 1, 2018 to May 5, 2018, is another case of Bad news from your radWeather Report. 34.25% of 2018 is gone. Use a fast InterNet connection or run the look-ups as a background task. Either way, you get the data yourself. No monitored cities are below the MaxNormalSafeLevel.